This package contains tools for designing user interfaces. A first palette helps create special effects using transparency of front panel. Using them allows to quickly create fade-ins or outs using linear or exponential variation of the intensity. A second palette contains VIs to calculate the position of GObjects for many purposes like alignment, snap, mouse follow, etc. 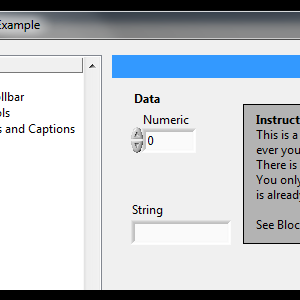 A third palette contains VIs to create dialog boxes based on class instances. "Simple Error Dialog" and "Simple Selection List" are featured with or without backrground blackening effect. A fourth palette includes some VIs to move objects programmatically on the front panel, using a basic deceleration algorithm to provide an impression of a smooth movement. The packaged VIs are all namespaced using a suffix “__lava_lib_ui_tools” which should not conflict with any of your own code. 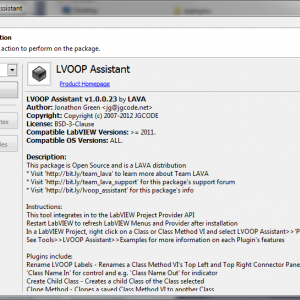 This package is distributed on the LabVIEW Tools Network (version 1.3) and updates are on LAVA (1.4). 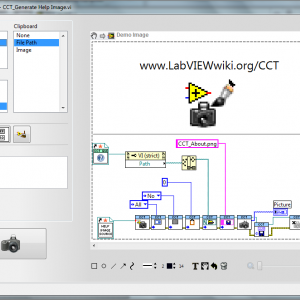 It can be installed directly in the addon folder of any LabVIEW version from 2012 to now. The addon installs automatically under the LAVA palette of the addon submenu. If you have any problems with this code or want to suggest features, please go to www.lavag.org and navigate to the discussion page. The Library contains supporting VIs that integrate with the LabVIEW Preferences Dialog to simplify file IO using OpenG VIs. Use the Tool Menu or NI Example Finder to view examples of how this tool works. 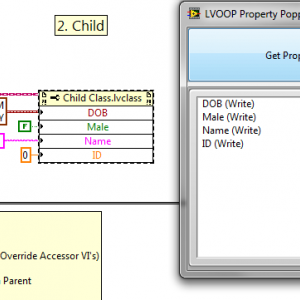 LVOOP Property Popper is a tool that aids in debugging Class Property Nodes.